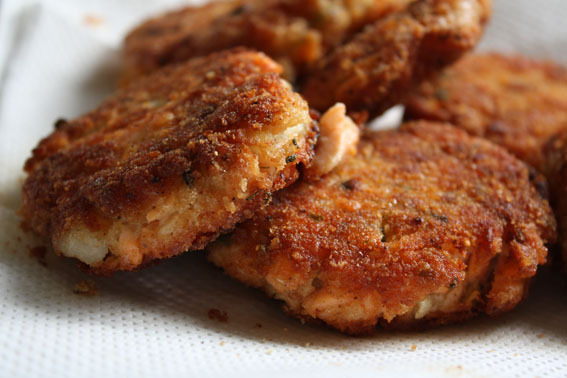 Last weekend’s birthday party excesses left us with a heap of leftover poached salmon – the perfect excuse to indulge in some sixties-style comfort food: the classic salmon patty. I made these last Sunday for a friend whose French mother happened to telephone as I was cooking and, being French, asked what was for dinner. My friend graciously described these little babies as salmon croquettes, which sounds far more glamorous. You can call them what you like, but they are sweet, crunchy, deliciously simple. I enjoyed them so much that I cooked them again in a different house a few days later – this time not with leftover salmon but one medium fillet. Both times I discovered that a little salmon goes a hell of a long way (a single salmon fillet and one large potato made 12 medium-sized patties, for example), so I had leftovers to freeze both times. The second time I steamed the salmon fillet till just cooked through. This recipe is for the single fillet as it’s easier to work out quantities, but you’ll be able to judge for yourself – I’d suggest marginally more salmon than potato, and enough egg to make it bind. 1. Fry the onion, garlic & dill stems till soft. 2. 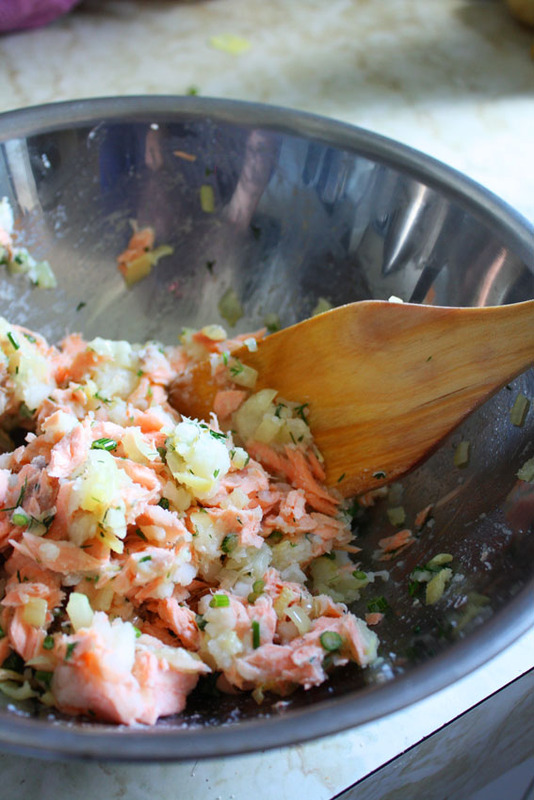 Combine the potato, salmon & onion mix in a bowl. 3. Add the broken egg and mix till well combined. 4. Form the mix into patties about 5cm diameter, and while the oil is heating, coat in breadcrumbs on either side. 5. When the oil is quite hot, shallow-fry on both sides till golden, and drain well on kitchen paper. Serve with a green salad and a big fat dollop of yoghurt mixed with a little honey, lots of salt and chopped dill. Since the advent of refrigeration and better transport, there’s no storage imperative to salt fish. But try telling that to the Portuguese, who have bacalhau so firmly entrenched in their culinary repertoire there’s no turning back. Soaking in water renders the stiff, dried fish soft, palatable and ready to be made into any of the 365 recipes the Portuguese have devised for it. But salt cod isn’t only the preserve of the Portuguese. The French are also fans of salt cod, which they call morue, and transform into warm puree with olive oil, garlic and moistened bread. She samples salt cod French, Portuguese & Italian style. And it sounds good. The Empress Clifford-Smith turns her attention to small and salty fish in her column this week – and oh my, how good does that little sardine number from the Burlington look? You will find Steph’s Good Living column here. A flying visit to the tropics for the weekend, with family at beautiful Magnetic Island in far North Queensland. It is an excellent escape and we plan to do it again before winter is out. Perfect swimming weather, and still warm enough to eat outdoors in the evening. So if it’s cold where you are, and you want to pretend it’s still summer, turn up the heat and whack this on the table for the easiest lunch in the world. 1. Cooked prawns. We had tigers one day and red spots the next – succulent, flavoursome, delicious. 2. Bread. Sourdough best, otherwise any good crusty white. 3. Green salad with good oil & balsamic dressing. 4. Mayonnaise – preferably Norganics Soya Mayonnaise, otherwise Hellman’s (or homemade, obviously, if you can be bothered). 5. Two glasses of Veuve Clicquot.